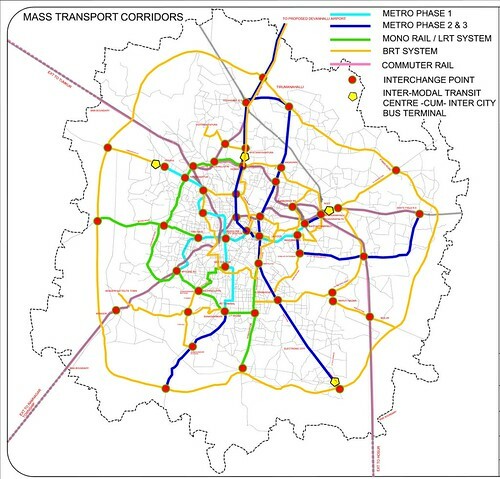 CTTP has all the details for improving transport facilities in Bengaluru through various options. While the Metro / Mono take their own sweet time for completion, making use of the existing railway network on a limited scale on a few routes can be an immediate solution. I understand that the railway lines cover only a certain portion of the city, and local train transport with feeder bus services will have a great impact for that portions. The Kengeri-Whitefield route can be a pilot route as it is already an electrified double track. With the BMTC & private industrial managements, including software tech parks providing feeder services from their respective places to the nearest terminals, this can be a very effective solution in the immediate future. Our daily traffic situation is only growing worser day-by-day and i believe if this is implemented in a small way, our city can become better. sivanand, are there any stations on the south side other than gyanabharati which can take some pressure off SBC? that brings me to another question. how are the electrified tracks between kengeri and SBC being used right now? are they idle? another question, how about the line to devanahalli is it double and electrified too? Subba, as per the railway map of BLR, there are stations at Bidadi, Hejjala, Kengeri, Jnanabharati, & nayandahalli. i have witnessed a few months ago a double track being laid near jnanabharati & going towards kengeri. CTTP sources say that electrification is ready from mysore rd jn. stn towards city, but i'm not sure. Sadly, electrification is available only towards chennai. From byappanahalli towards yelahanka/devanahalli there is only a single track and not electrified. also needed train service to Devanahalli on chikaballapur line. i suppose the high speed rail corridor planned will see light only at time of my GGchildren ;-) why not use the existing rail line better. btw I suspect SWR not responding enthusiastically, they seem to kind of disinterested in developing rail network in k'taka. We need to protest this attitude of SWR authorities. ps: i base my view on SWR on many facts: i) Broad guage conversions taking ages to complete. kottur-harihar,chamarajnagar.. many are languishing ii) they reluctantly start mangalore service on a circuitous route. there are nearly 10 trains to chennai & the important port city of Mangalore is denied the special treatment. iii) Hardly any new rail lines sanctioned and marginal allocation in budget. While there are a lot many issues needing action for improving traffic, i would like to focus on the railways. In a meeting with Janaagraha, i was also apprised of their efforts on the progress being made for hi-speed rail connectivity to BIAL, and their concerns on the growing rail traffic in the heart of the city which may call for more infrastructure development. Undoubtedly, various vested interests participating from various corners influence in doing / not-doing projects, or not completing on time. I believe that a focused approach on a particular solution should be taken to deliver OR a body is constituted with full powers to continuously monitor & deliver. Simple solutions instead of fancy stuff will do magic to the existing situation. Looking for some solution coming up in 5-10 yrs time will only worsen the everyday situation. Hi TS, Upto Kengeri in the Bangalore-Mysore route is doubled and there is no waiting for the crossing from past 8 months. One track is electrified and the newly laid track is getting electrified. Upto Bidadi, doubling work is almost complete. There are some points near Kengeri where it is pending. Track is electrified only upto Kengeri. Goods train coming from Chennai with Electric Engine and going towards Mysore goes upto Kengeri with the Electric Engine where the engine is changed to Diesel. To have a local rail with existing tracks, we need electrification from Bangalore Station to Yelahanka via Yeshwanthpur as well as from Byappanahalli to Yelahanka and Byappanahalli to EC. There is double track upto Yeshwantpur. From Yeshwantpur to Yelahanka there is a single track and very few train passes in this line. Also from Yeshwantpur to Byappanahalli there is a single track unelectrified rail link which is not properly utilized. Only when there is a problem on Byappanahalli to Bangalore link, this line is used as a backup. These lines, if electrified and EMUs are run, can help reduce the journey of many commuters as well as complement the upcoming metro/mono combination. Someone has to ring the bell to SWR. TS, Wonderful observation. If lobbying is the need of the hour, i believe we can collectively participate & make this happen by pressing our leaders & authorities - MPs, MLAs, SWR, & industry; to be more proactive. New grade separators to ease traffic!!! "New Year promises to ease traffic woes" - was the headlines of today's Deccan Herald. This article mentions abt few grade separators getting ready every month of the next qrtr, and hopes to ease traffic. How long do we still need to realize that more roads are also accompanied by more vehicles, which only means that the grade separators shall only decrease the loads on those junctions, only to reappear on the next one. There are steps on introducing the Bus rapid transport system which has worked in a few cities around the world wonderfully & needs to be tested in Blr. Meanwhile, it still beats me as to why there is still no mention of any initiatives on the Commuter Rail System. With some good coordination between the railways & local govt authorities, this can prove to be very beneficial for the city's commuters. And then, any upgrades to the roads will be found to bear fruitful results. The doubling on the Mysore line is now complete and operational till Ramnagaram. However, electrification is complete on only one of the lines upto Kengeri, and hence no electric engines use this line now. Doubling of Yesvantpur-Banaswadi-Baiyyappanahalli-Yelahanka, if carried out, could be used to run CRS shuttles. Bangalore-Whitefield line is very congested at present and I believe that is why SWR is reluctant to take up CRS there. Even the existing trains on this route are very popular. I recently travelled on the Bangalore-Bangarapet afternoon shuttle and found it to be jam-packed. The train has only 8 coaches. Similar shuttles between Bangalore-Tumkur, after doubling is complete, would also be useful. Frequent shuttles like these would serve satellite towns and reduce some of the pressure on Bangalore. KR Puram station - no morning rush? no Commuter Rail!